This handy pictorial guide will assist you to identify and appreciate some of the best of our local Moreton Bay classics. Drawing on their extensive photographic collection, Andrew Harper and his photographer, David Millar, have selected 128 mostly unseen photographs of the 64 classics featured in the Classic Moreton Bay Cruisers publications. David’s captivating photographs showcase each of the wooden classics in scenic locations across Australia. 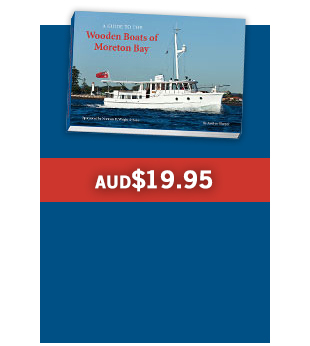 ‘A Guide to the Wooden Boats of Moreton Bay’ will appeal to all boat lovers and, for others, will serve as a great introduction to the world of wooden boats. This superb hardcover guide presents 128 pages of classic wooden boats. Format is a compact size (210 x 140mm). This pictorial book features 64 locally built classics of Moreton Bay.